Let’s say you roasted a chicken last night and now you have the leftover meat in your fridge. If you have a few cans of the right stuff on the shelf you can have a whole new meal with that leftover chicken. With mostly the same ingredients you have 2 choices, a salad or a soup. Both are easy and don’t require much more that opening a few cans and chopping a vegetable or two. Go ahead and toss in any other vegetables you have kicking around the produce drawer-both of these recipes are excellent with celery or carrots added. The salad could benefit from a few slivers of red onion, too. The rice can be cooked ahead of time and let cool. Measure out one cup of rice (dry) and cook according to directions. Rinse the corn and beans in a colander, drain to dry. When the rice is done let it cool in a large bowl. 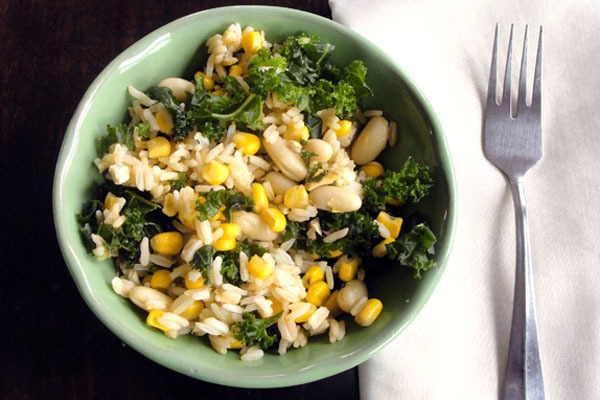 Add the corn, beans, chicken and kale to the bowl. Toss with olive oil, balsamic and any herbs you have. You can also use salad dressing from a bottle. Add salt & pepper to taste. If it feels a little bland, this is a really good place to add a little hot sauce like Sriracha. Rinse the corn and beans in a colander, drain to dry. Heat the olive oil in a soup pot over med-low heat. Cook for 5 minutes or until onion gets soft but does not burn. Add chicken broth, corn, beans, kale, rice, and leftover chicken. Add herbs, salt & pepper. Bring to a boil then reduce to a simmer. Put a lid on the pot but leave it ajar and simmer for 30 minutes, stirring once or twice to ensure the rice is not sticking. Serve with a little Sriracha. 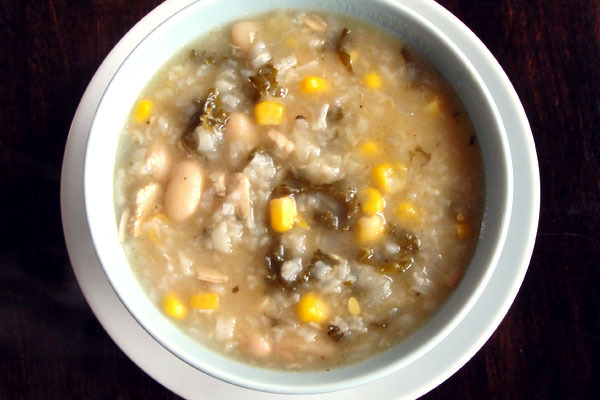 This entry was posted in Dinner, Lunch and tagged beans, broth, Cannellini, chicken, corn, herbs, kale, Sriracha on December 16, 2013 by nursingmomscook. For the love of all things warm and in a bowl, I have another soup for you today. When I need to throw together a meal in a pot, this is my go-to soup and if I’m on my game, I’ll have half the ingredients already sitting around my house. If my cupboard is well stocked I’ll have several large cans of tomatoes (diced, crushed, whole plum, whatever) alongside white beans and broth. The kale seems to come into my life in a constant flow whether its via my CSA or my good intentions at the store. More often than not it ends up wilting in my fridge but here’s a way to save it from that fate. Did you know you can keep grated parmesan in the freezer? Because its finely grated you can pull a bag of it out the freezer, spoon a little on the hot soup and it will melt nicely. Heat the oil over medium heat in a large saucepan. Add the onion and sauté for 3 minutes. Add the garlic, reduce the heat to low and sauté for another 7 minutes stirring often. Add kale and cook for 1 minute. Add the tomatoes, stock, and beans. Bring to a boil then immediately lower to simmer. Add basil and rosemary. Simmer uncovered for 30 minutes stirring occasionally. Ladle into bowls and top with grated parmesan. 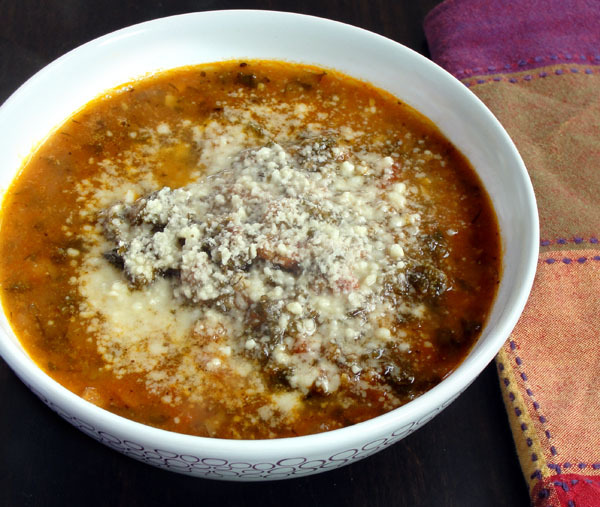 This entry was posted in Dinner, Lunch and tagged bean, glutenfree, kale, soup on October 21, 2013 by nursingmomscook. Question: What food is rich in vitamins K, A, and C; is an excellent source of beta-carotene, has risk-lowering benefits for 5 different types of cancer, has antioxidant and anti-inflammatory benefits and can be eaten with the enthusiasm of a stoner approaching a bowl of Nacho Cheese Doritos? Answer: Kale chips. Who knew? 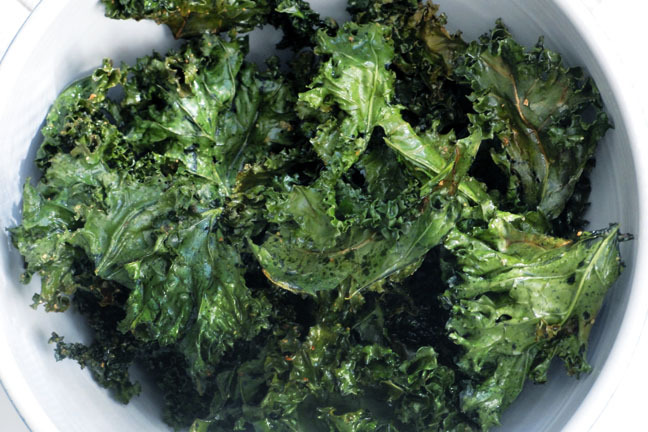 There are many varieties of kale to choose from but curly kale works best for making kale chips. It is absolutely essential that you use fresh kale and not the stuff from a bag. Supermarket bagged kale has a questionable shelf life, it will take on an acidic and unpleasant taste if you try to use it here. Washing and drying the kale may be the most time consuming part of the prep work since the curly leaves are really good at hanging on to drops of water. You want to make sure all the water is gone since you will need to toss it in olive oil. 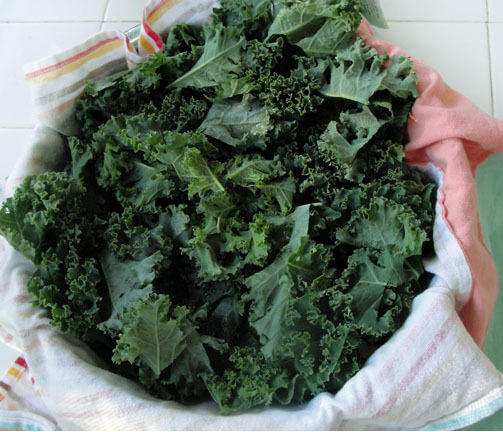 To chop up a fresh bunch of kale, fold the leaf over and slice the thick stem away. Chop the remaining leaves in half. The kale will shrink up significantly when baked. Remove the kale from the stems and chop the leaves into smaller pieces. Rinse and dry and put in a large bowl. Toss with olive oil using tongs to squeeze as you toss so the leaves are thoroughly coated. Dash with salt and garlic and toss some more. Spread kale on a baking sheet* making sure none of the leaves are overlapping. Bake for 12 minutes making sure the leaves are crispy when they come out. Let cool and eat. And eat. And eat. *You will either need to use 2 baking sheets or bake the kale in several batches. This entry was posted in Snacks and tagged anti-inflammatory, antioxidant, beta-carotene, chips, gluten-free, glutenfree, kale, snack, stoner, vegan on September 30, 2012 by nursingmomscook.